St. Clair Hotel, northeast corner of Metcalf at Ferry, 1891 (present Gateway site). It was intended to be a home away from home for the "better sort." The creation of banker C.W. Waldron of Fairhaven, the hotel was planned to bring some class to the muddy company town of P.A. Woolley. Do you have photos or documents you would like to share about your family or the old days here? Please consider emailing the scans as attachments or use regular mail for copies. Our records of very early Woolley town are very sketchy because the newspapers from 1890-98 burned in various fires that ignited often in the early woodframe buildings. As far as we know, the Keystone Hotel on Northern avenue was the first place of lodging in P.A. Woolley's company town, which formed at the crossing of the three railroad lines. That hotel stood at what would now be the north end of the Coast to Coast Hardware building, which now stands at the corner of Eastern avenue and Northern Avenue. The old Keystone building was torn down in about 1958 and a Safeway store was built in its place. That store later became the Prairie Market and now houses Coast to Coast. P.A. needed a more respectable hotel for the financiers and upper crust travelers who visited his company town from 1890 onwards and demanded more amenities. The Keystone, which stood across from the train depot, was a "den of iniquity," according to detractors through the early 1900s. The Alexandria Hotel, built with flare at an undetermined location on that block between Ferry street and Norhern, was a firetrap and, sure enough, it burned in about 1893, within a year or two of being built. Since he was not a hotel man, Woolley searched for someone with the right pedigree to build a home away from home for the better sort. He found just the man in Fairhaven, the town 25 miles to the northwest that was booming at the same time. That man was C.W. Waldron, who moved to Fairhaven in 1889 and soon capitalized the Bank of Fairhaven, the first bank in that city, for $50,000. He came from Hillsdale, a rail center in south-central Michigan, and the 1890 Fairhaven Illustrated magazine called him a "man of large means," who was the "largest purchaser of property from the Fairhaven Land Co."
Back home he was president of the Second National Bank of Hillsdale and he apparently invested in property around Detroit and Lake St. Clair. His other major investment on Bellingham Bay was the Whatcom County Investment Co., which helped finance the grand four-story Hotel Fairhaven. The first mention of his Skagit County investments that we have discovered was in the Feb. 1, 1890, Puget Sound Mail newspaper of LaConner. The story noted that Waldron invested in the Cascade Mining Co., which had recently bought the Boston Mine in the Cascade foothills and planned to extract 50,000 tons of galena ore that year. Galena consists of silver and lead among other minerals. Woolley wooed Waldron and even named a street in his honor, the one that is now north of Sedro-Woolley's new police and fire hall, which opened in 1998. 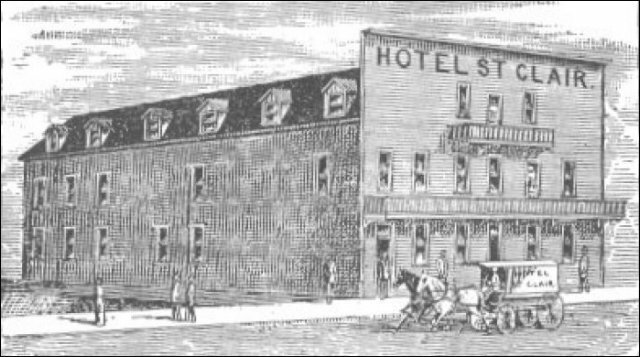 In return, Waldron bought lots on Metcalf street and in 1891 constructed the St. Clair hotel on the northeast corner of Metcalf and Ferry streets, the present Gateway Hotel site. An undated clipping from the Bellingham Herald of 1891 gushed that the St. Clair was the "only first class hotel in the 'magic' city of Woolley." Partners Means and Lyles were hired to manage the new inn and they featured a bar with brass rails and spittoons and red plush velvet, the symbols of high-class cocktailing in those Victorian days. The advertisement bragged of superior meals and large, clean rooms and insisted that the bar was stocked with the choicest cigars and the best wines and liquors. About four years later the hotel was renamed the Osterman House, the name it was usually known by until recent documents surfaced about the St. Clair days. James And Maggie Osterman moved to Woolley in February 1895 to manage the St. Clair Hotel for, presumably for Waldron. Sometime afterwards they changed the name to the Osterman Hotel. The family moved here from New Whatcom [now part of Bellingham]. James was the first telegraph operator in Whatcom county from 1875 on at a place called simply, The Crossing, on the Nooksack river, just west of present Everson. They also managed the Hotel Sedro in new-Sedro until it burned the second time in 1897. James was an invalid from a buggy accident and Maggie became one of the most famous businesswomen in town. An advertisement in the 1901 Criterion Club annual [the first annual for Sedro-Woolley High School advertised: "Headquarters for commercial men. Dining room: Meals 35 cents, Breakfast 5:30-9 a.m.; luncheon noon-2 p.m.; dinner 6-8 p.m., strictly First class." The Ostermans primarily catered to the commercial trade, devoting a third of the ground floor to a samples display room. This photo of the Osterman is the first such photo we have of either the hotel or the eastern side of Metcalf Street before June 1909, when the Osterman burned to the ground. We think it was taken in sometime after 1906, when the concrete was available from the plants that opened on both sides of the Baker River, in what became the city of Concrete. The Wixson Hotel replaced the Osterman in 1910. > Susie Osterman Alverson Their daughter, Susie, and her brother grew up in the hotel. Susie was born in 1881 at Nooksack in Whatcom County and grew up in the Osterman House. She was the toast of the town in her teen years and eventually became the town's longest-lived pioneer. She worked in the lobby and encountered everyone from the traveling salesmen and money men to the muddy loggers who were fortunate enough to get a weekend off from the logging camps upriver and south of the river at Clear Lake and Big Lake. The Osterman House was the closest hotel of repute to the train depot, which was located where the three rail lines crossed two blocks to the northwest. Loggers were not allowed to check in until they were groomed by one of the nearby barbers, usually J.C. "Jack" Ames. Agents of hotels in Woolley used to ride the Seattle & Northern train to logging camps, where they sold tokens to the loggers who often went weeks without a real bath. The token entitled them first to a delousing, and then a hair cut and shave at Jack Ames' shop, so that they would be presentable. The token was also good for a room at the Osterman House or the Grand Central Hotel further south on Metcalf. For the adventuresome, another token entitled them to one "throw" at any of the participating brothels. A bakery stood two buildings north of the hotel and in between was the Klondike Saloon, which burned to the ground in 1899. It was replaced by the Wilson Club, which stood through the famous Bank Robbery of 1914 and was eventually replaced by the Wixson Club, an adjunct of the Wixson Hotel, which replaced the Osterman. The first baby step towards a library was taken by the Seattle & International Railway when the railroad converted a small office north of bakery into a reading room in 1899. The hotel was truly the epicenter of the fast-growing boomtown. In May 1899, Sedro-Woolley celebrated the town's recent merger by connecting to a long-distance telephone line owned by Sunset Telephone Company that linked towns on a 12-mile circuit from Hamilton to Burlington and then beyond. In December 1899 Susie Osterman doubled as the "Hello Girl" on the phone line, replacing Hallie Ormsby, who was getting married to J. Bruce Holbrook, who was a partner with her father in a transfer business, having recently moved here from Marengo, Iowa. Susie becomes Mrs. Ted Alverson In 1906, Susie married L.E. "Ted" Alverson, who moved here at the turn of the century from Marengo, the home town of so many wives of the town fathers in the 1890s. Ted's father was a druggist in Marengo, but Ted did not follow that trade. He was city clerk of Sedro-Woolley at one time and in 1912 he was appointed manager of the Interurban railroad line and then manager of the Stone & Webster Electric Company, parent of the Interurban. Susie and Ted later owned a music store, located first on Metcalf street in what we now call the Lederle building and later on State street. She was a charter member of the Territorial Daughters club, which started in 1936. Susie established an identity of her own in Sedro-Woolley, completely separate from her parents and from her husband. By the time that I was in grade school in the 1950s, she was the grand old woman of town, who collected vital statistics on local residents, riding around in her touring car with her Irish setter, King. Susie outlived her fellow teen girls from the new town and passed away in 1965. Susie and Ted made their home on Warner Street, across the way from our only surviving Sedro mailman, Harold Renfro. I was fortunate as a child to know Susie for 15 years. She was famous for having "special powers," as she called them. When I was in grade school I had terrible warts on my hands and my mother was frustrated that even Doc Wallen in Burlington could not remove them with either chemicals or cauterization. Susie said she had a solution; she would buy them. My mother rolled her eyes at that one, but Susie was her best friend and Mom decided, what the heck. Susie took my hands in hers, stared into my eyes and laid a coin inside the palm of the hand that was most infected. She told me to close my eyes and imagine them gone. Within weeks they had totally disappeared. Susie used to show me a marvelous scrapbook with photos of both Sedros and early Woolley. Some of it wound up in the hands of local barbers who pasted the photos on the walls of their tonsorial parlors. We hope that a future reader might know where the rest of the scrapbook lies today. It is one of the treasures I most fervently seek. I can still remember the leather binding and the black pages of the thick book that she placed on a bible stand in the parlor of her house. Hugo Bauman and the Osterman House The Osterman House was bought by Hugo Bauman in either 1900 or 1902, according to different sources. Born in Pennsylvania and educated at a private college in Baden Baden, Germany, Bauman became an attorney in Pennsylvania in 1889, the year that Washington was granted statehood. The law apparently did not settle with him because he went to work at the famous Palmer House hotel in Chicago in 1890 and rose through the ranks there, hosting travelers to the 1893 World's Fair. 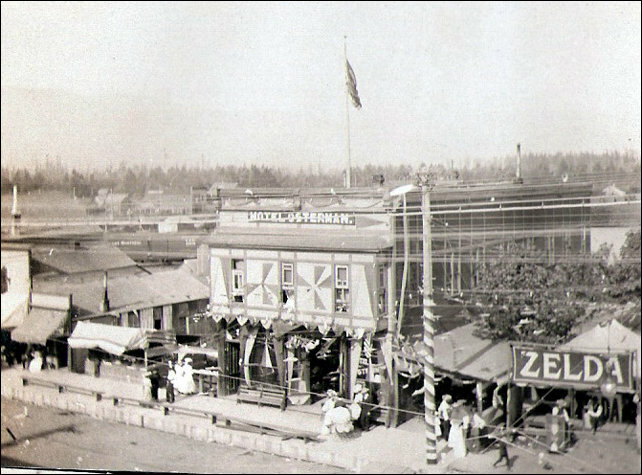 After that he worked for hotels in New York, then Portland in 1897, then Seattle, and finally in Bellingham. He retained the Osterman name through at least 1905, and sold out in the fall of 1909 to John Wixson, the famous lumberman of Wisconsin and Big Lake. The hotel burned three weeks later and Bauman was held responsible for heavy losses. He soon bought the former Rockport Hotel in that city and remained a famous hotel man for at least the next 20 years. A Republican, he served three terms as county commissioner. Read about and the fire that destroyed his Rockport Hotel in 1952; and Hugo Bauman and Will D. "Bob" Jenkins's tales of the upper Skagit. Story posted on Jan. 1, 2001, in Issue One of our Subscribers Edition. 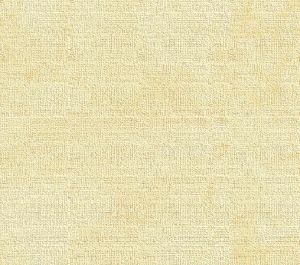 See this Journal website for a timeline of local, state, national, international events for years of the pioneer period. Please report any broken links or files that do not open and we will send you the correct link. With more than 550 features, we depend on your report. Thank you. You can click the donation button to contribute to the rising costs of this site. You can also subscribe to our optional Subscribers-Paid Journal magazine online, which has entered its seventh year with exclusive stories, in-depth research and photos that are shared with our subscribers first. You can go here to read the preview edition to see examples of our in-depth research or read how and why to subscribe. Would you like information about how to join them? Oliver-Hammer Clothes Shop at 817 Metcalf Street in downtown Sedro-Woolley, 86 years.